Top TEN national Freshman yearling Sire in 2013! Sire of $160,000 BARRETTS SALES TOPPING YEARLING in his First Crop! The #1 Freshman Sire outside of Kentucky in 2013, ranked among the Top Ten nationally with a seven yearling average over $53,000. First 2YOs sold for up to $105,000, and his first runner BIG SWAG, won first time out in maiden special company at Santa Anita by 31⁄4 lengths. 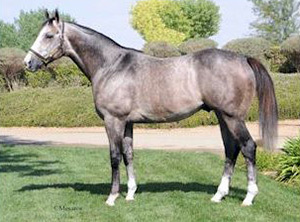 Santa Anita Graded stakes-winning miler by Top California Sire KAFWAIN. Won 3 of 5 starts, including the G3 Sham S. by 6L (107 Beyer) and G3 San Rafael S. at one mile. Out of a half-sister to the dam of 2YO G1 SW STORMELLO ($700,100) and 2012 G2 Del Mar Derby SW MY BEST BROTHER ($346,090). Thermodynamics (2012 f, by Unusual Heat) In US, 2 wins, 3 to 4, placed at 5, 2017, $156,158, 2nd Melair S.
Bullwinkle Babe (2012 f, by Kalanisi (IRE)) In US, Placed at 2 and 3, $32,855, 2nd Arizona Oaks. Sheeza Sassy Girl, 3 wins 2 to 3, 2017, $45,840. So Heres the Thing, winner at 2, placed at 3, 2017, $39,595. Bottle Service, placed at 2 and 3, 2017, $39,145. Big Swag (2012 g, by Boundary) In US, Winner at 2, $34,350. Moussed Up (2012 g, by =Danehill Dancer (IRE)) In US, Winner at 3, $34,100. Eagle Rock (2012 g, by Precocity) In US, 2 wins at 3, placed at 4, $33,626. Red Car Mac, winner at 3, $32,725. Counterplay (2013 g, by Lemon Drop Kid) In US, 4 wins 2 to 4, 2017, $32,442. Solar Zone, winner at 4, 2017, $32,205. Moussehistopheles, 2 wins at 4, $28,730. At 3: 1st Sham S.-G3 at Santa Anita Park (by 6 lengths, defeating Take the Points, Mr. Hot Stuff, Bournon Bay, etc. ), San Rafael S.-G3 at Santa Anita Park (defeating Square Eddie, Ryehill Dreamer (IRE), Brother Keith, etc. ).